The Woman who Saved the Children by Clare Mulley is an unconventional biography of Eglantyne Jebb, a radical woman who once remarked that she “didn’t care for children”, yet defied social expectation and crossed not only deep-rooted class divides in Britain, but also the unstable national borders of a European conflict zone, before breaking the law to bring relief to the starving children of Britain’s former enemies at the end of the First World War. 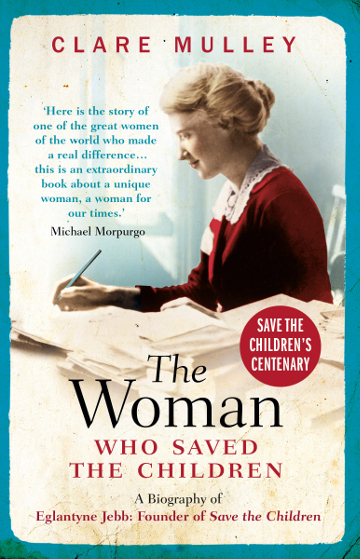 Winner of the Daily Mail Biographers’ Club Prize, and now republished to mark the centenary of Save the Children, The Woman Who Saved the Children brings to life an audacious, passionate and compassionate woman who not only helped save millions of lives, but also permanently changed the way the world regards and treats children. All author royalties are donated to Save the Children. This was your first book; why did you decide to write it? 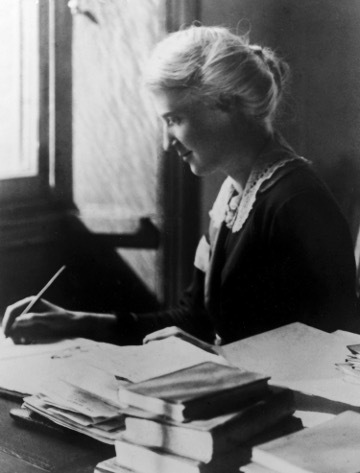 I was working at Save the Children, the development agency Eglantyne Jebb founded in 1919, when I first heard her story. A few years later I went on maternity leave, thereby showing far less commitment to the fund than Eglantyne, who never had children and devoted her life to the cause. This seemed a good time to find out more about her. Seven years, two jobs, an MA, and three children later, I had written The Woman Who Saved the Children. While I was aware of the irony of slipping away from my own childcare responsibilities to research the life of this remarkable children’s champion, I think our different life experiences suited both of us to our work well. I valued every moment at my desk (and away from it), while Eglantyne was more strategically minded. It doesn’t necessarily help to be maternal, or sentimental about children, when seeking to prevent their deaths from starvation. At a time when many people had no interest in the suffering of Britain’s former enemies, Eglantyne defied convention, and even the law, to save lives in Germany and Austria. And it was her respect for children that, five years later, led her to pioneer the then revolutionary concept of children’s human rights. The UN Convention on the Rights of the Child, the most universally accepted human rights instrument in history, has since evolved directly from her work. What was it about Eglantyne Jebb that drew you to write about her in particular? 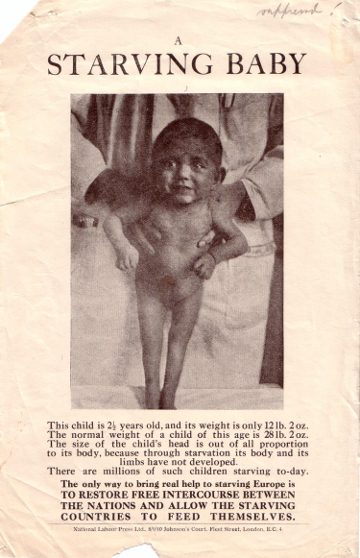 Among the papers I found in Save the Children’s archive was a crumpled leaflet featuring a photograph of an Austrian toddler looking more like a six-month-old baby; her body undeveloped as a result of malnutrition. In the top right hand corner is the word ‘Suppressed!’ scribbled in Eglantyne’s unmistakable scratchy writing. The exclamation mark shows her personal indignation at the policy of the then Liberal government to continue the economic blockade to Europe after the armistice at the end of the First World War, as a means of pushing through harsh terms. The human cost of this policy was the starvation of thousands of the most elderly and youngest in Austria and Germany. 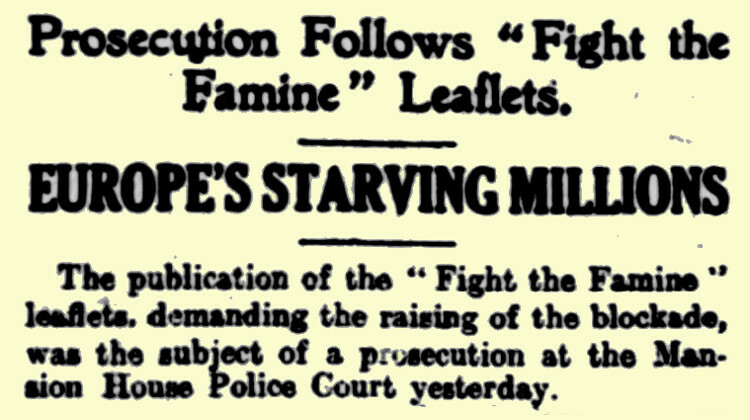 This leaflet was one of hundreds Eglantyne distributed in Trafalgar Square, a traditional site of public protest. Some accounts had her chalking up the pavement, suffragette style, with phrases like ‘Fight the famine’, when she was publicly arrested. She was an unlikely children’s saviour, wasn’t she? Saviour is not a word that Eglantyne would have used. She was certainly not maternally motivated, if that is what you mean. She never had children of her own, and was not fond of those of friends or family, once referring to them as “the little wretches”. I even found a letter to her close friend Margaret Keynes, younger sister of the economist, written the year she and Dorothy launched Save the Children, in which she moans, “I suppose it is a judgment on me for not caring about children, that I am made to talk all day long about the universal love of humanity towards them”. Eglantyne was not much interested in individual children, but she was a deeply compassionate woman who managed to harness a universal concern – the wellbeing of the next generation – to save thousands of young lives, and restore a sense of international community and humanitarian responsibility after the devastation of the war. How did she persuade people to care about starving children in European countries that Britain had recently been at war with? There must have been opposition. Absolutely. Many of the crowd that arrived to hear Eglantyne and Dorothy launch their Save the Children Fund at the Royal Albert Hall in May 1919, had brought rotten fruit and vegetables to throw at the “traitor sisters” who wanted to give succour to the “enemy”. Not surprisingly, Eglantyne started nervously, but her voice rose with her passion until she called out, “Surely it is impossible for us, as normal human beings, to watch children starve to death, without making an effort to save them.” There was silence in the hall, and then a collection was taken up. Eglantyne’s Christian faith was very important to her, and in 1920 she wrote to the Archbishop of Canterbury for support for her non-political, non-denominational cause. Recognising her from the papers, he chose not to respond. But Eglantyne was not a woman to take no for an answer. Instead, she wrote to the Pope, who invited her to meet him. In response, the Pope asked for support for Save the Children not only from Catholic churches in England, as Eglantyne had requested, but across the world. Once Archbishop Randall heard this, the Church of England quickly came on side too, as did many other faith groups. It was this international, multi-faith, support that really placed Save the Children on the map. Eglantyne had won the public argument. Did you discover anything unexpected while researching The Woman Who Saved the Children? The Jebb family, who still support Save the Children, very generously invited me into their home and let me look through about ten large boxes of papers relating to Eglantyne. Here was everything from childhood drawings of “the phantoms of Eglantyne’s mind” to the romantic social novels she wrote when older. They had four clever children, the eldest of whom was called Eglantyne – but later changed her name to Polly. I knew that Eglantyne had fallen in love with a Cambridge don some years earlier, the horse-riding Marcus Dimsdale, who later gallops up hill and down dale in one of Eglantyne’s social novels, so I had not been expecting to find a romance with a woman. Their wonderful, gossipy letters told a more deeply moving story than any of Eglantyne’s own novels, and really brought both women to life. Eglantyne is probably not as well-known as she might be. Is there any reason for that? And should she be a household name? I am sure that Eglantyne’s affair with Margaret has meant that her story was kept quiet historically. In any case, there is a rich seam of untold women’s stories. Last year the treasury put Jane Austen on both the new £20 note and the £2 coin. I love Austen, but it was as if they could not think of another woman worthy of the honour! This year marks the centenary of Save the Children, and I will be helping to unveil a new (privately-sponsored) bronze bust of Eglantyne by the award-winning sculptor Ian Wolter. I have also asked the National Portrait Gallery to consider adding a recently discovered original plate-glass photograph of her to their collections. And, of course, my biography of Jebb is being republished with a new introduction and cover. All author royalties are donated to the charity – so please do buy a copy! Clare Mulley is the award-winning author of three books. The Woman Who Saved the Children won the Daily Mail Biographers’ Club Prize, and The Spy Who Loved, now optioned by Universal Studios, led to Clare being decorated with Poland’s national honour, the Bene Merito. Clare’s third book, The Women Who Flew for Hitler, is a dual biography of two extraordinary women at the heart of the Third Reich, who ended their lives on opposite sides of history. A regular contributor to TV and radio, Clare also reviews non-fiction for the Telegraph, Spectator and History Today. She was chair of the judges for the HWA 2017 Non-Fiction Crown, and is an honorary patron of the Wimpole History Festival. The Women Who Flew For Hitler was longlisted for the 2018 HWA Non-fiction Crown award and was chosen in Historia’s round-up of the best historical books of 2018. Read Clare Mulley’s interviews about The Women Who Flew For Hitler and about her writing life.